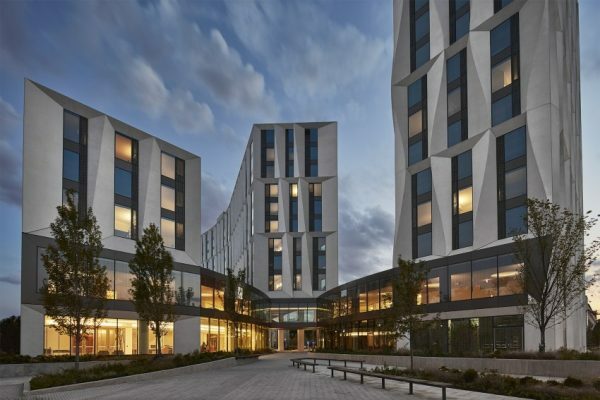 At University of Chicago, the Campus North Residential Commons, designed by our friends at Studio Gang, provides social spaces and experiences with a view towards “[enhancing] campus and academic life for today’s undergraduates,” says the Gang. The site covers a full city block and is poised as a new point of entry to the campus for the greater Hyde Park community,—Gang calls this a new “front door”—one which might encourage interactions among UofC students of diverse backgrounds, and strengthen connections between the campus and nearby communities. Campus North for short, the structure is more mixed-use than dormitory, providing a combination of student residences, dining options, amenities, outdoor green space, and even retail volumes. In terms of design the Campus North complex comprises three slender bar buildings woven into a fabric of plazas, gardens, walkways and courtyards; pre-cast concrete panels are used to clad the building, creating a contemporary facade but one informed by the neo-Gothic tradition of the campus’ architecture. The Campus North Residential Commons is LEED Gold certified featuring, among other sustainable interventions, argon-filled, low E insulated glass and continuous closed cell foam-insulated building envelope; additionally, all cooking oil from the Dining Commons is recycled into biofuel.